The Best Food In Ipoh - 15 Foodie Tips That Will Make Your Belly Rumble! In a city that remains relatively undiscovered by mass tourism yet features so many delicious dishes, Ipoh makes it difficult to find the best of the best. We spent a week in Malaysia’s unofficial foodie capital, eating and drinking everything in sight for our quest to find the best food Ipoh has to offer! These mouthwatering dishes and drinks have truly earned their place on the list of the best food in Ipoh. If you look for more Asian food inspiration, then check out our post about the best hawker food in Penang or the best Asian Street Food. You can read through the list, or skip to your favourite using the links below. The first dish on our list is the famous Ipoh chicken and beansprouts. It was so delicious that we even ate it twice in the same week. When you order this dish you will be served several plates. One with tender, silky chicken, another one with warm, crunchy and juicy beansprouts, one with some cooked white rice and finally a bowl with some deeply flavoured chicken broth. You will also get an empty plate you can use to pile on your own combo of these. It is such a simple dish and yet it is absolutely some of the best food in Ipoh. Where to eat Chicken and Beansprouts: We had this fantastic dish at the Lou Wong Bean Sprouts Chicken Restaurant (see 1 on the maps below) in the old town of Ipoh and in sister restaurant Lou Wong Tauge Ayam Kuetiau (2 on the maps below) in the new town. This famous Ipoh chicken rice dish was created by immigrants from the southern Chinese province of Hainan. In Malaysia, it is also called Nasi Ayam which literally translates as rice chicken. In the preparation of Hainanese chicken, the whole chicken is poached at sub-boiling temperatures. Some of the oil and liquid of the stock created by the poaching is then used together with pandan leaves, ginger and garlic, to prepare the rice. It’s a very tasty and deep flavoured meal. Where to eat Hainanese Chicken: We recommend the Restoran Hainam (3) in the new town bit of Ipoh. If you are staying in the old town, it is really worthwhile making the short journey for this mouthwatering version of the Ipoh chicken rice. Yes, our third recommendation is also a chicken dish! Ipoh salted chicken is perfect if you fancy a carb-free option or just want to get a take away meal. To make the Ipoh famous salted chicken, a whole bird is marinated with salt, Chinese herbs, ginger and rice wine. Then it is wrapped in several layers of paper to keep the flavour in whilst baking the chicken. The taste is really intense – much more so than the previous two dishes which are very mild – and you can really smell and taste the salt and the different herbs. Where to eat Salted chicken: We got our Salted Chicken from Happy Delicious Salted Chicken (4) in the food area of the new town of Ipoh based on the recommendation of our host. In our opinion they serve the best salted chicken in Ipoh – it made us happy, and it was delicious. Are you planning to visit Ipoh and eat all the delicious food? Then we recommend you to check out all the other awesome things Ipoh offers, for example on a private historic Ipoh tour. This tour includes a Hotel pickup and drop-off, a local guide, breakfast and entrance fees to various attractions. Nasi Kandar is a very popular northern Malaysian dish, originally invented in Penang. It comprises steamed rice and a variety of different curries and side dishes, all on the same plate. Depending on what you order, there can be up to 5-6 different curries on the same bowl of rice? Sounds weird? Yes! Does it taste awesome? Absolutely! There is a place in Ipoh which makes such good Nasi Kandar that the local people have given it the hilarious nickname of Nasi Ganja. Rest assured that no marijuana was involved in the preparation of what we ate. But trying some Nasi Ganja is unquestionably a star Ipoh attraction for curious foodies. If you’re planning to visit Penang as well, then you can find some of its delicious dishes in our post about the best Hawker food in Penang. Where to eat Nasi Ganja:This famous and tasty Ipoh must eat is available at a street eatery that is really called Rumah Tumbangan Dan Kedai Kopi Yong Suan (5) and is located in the new town of Ipoh. But if you ask any local where to get Nasi Ganja, they will be able to give you directions to the same place. Tip: if you plan to eat in the restaurant, just enter and look for a table. The customers in the long queue outside are all waiting to get Nasi Ganja as takeout. Even though it can get super busy, we recommend this place for an appetizing lunch in Ipoh. Curry Mee, also called Curry Laksa, is one of the best noodle soups we ever had! (Alongside our Vietnamese favourites Pho and Bun Bo Hue of course). Ipoh Curry Mee is normally made with some thin yellow noodles, a spicy curry soup and a mix of various other ingredients like prawns, eggs, mint leaves, dried tofu and chicken. This is the perfect dish for everyone who loves spicy noodle soups. Where to eat Curry Mee: Believe it or not, we had some delicious Curry Mee at the Ipoh street food street inside “The Lost World of Tambun” theme park! If you don’t want to go to a theme park to get your fix of noodle soup, then Xin Quan Fang (6) in the new town area serves some of the best Curry Mee in Ipoh as well. Dim Sum are small, steamed Chinese dumplings, filled with various savoury or sweet ingredients. As they come in so many varieties and different fillings, that is about as accurate a description as we can give! They are popular in Ipoh due to the large ethnic Chinese population. They are eaten for breakfast, accompanied by hot tea. Normally you can just pick and mix your choices and eat them at a table. The more people you are, the better, because then you can share your Ipoh Dim Sum amongst one other. Dim Sum was probably our best breakfast in Ipoh. Where to eat Dim Sum: There are many Dim Sum restaurants near to the Hotel Excelsior. Our host told us that in this area you get the best Dim Sum in Ipoh. We tried the Restaurant Foh San (see 7 on map) which proved to be a great choice. Be prepared: these places can get really packed, especially for weekend brunches. 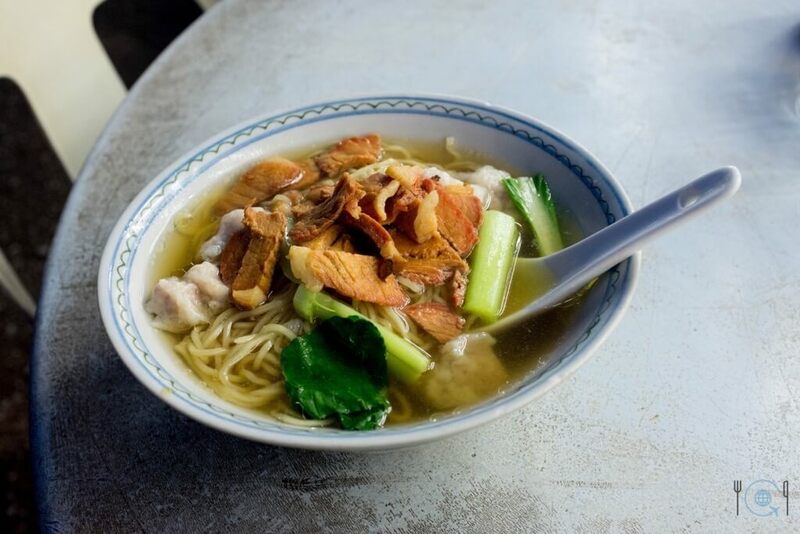 This variation of noodle soup comes with some thin noodles, a hearty broth, leafy vegetables, delicious won ton dumplings and stripes of barbecued pork. Although technically Chinese in origin, this was one of our favourite dishes in Malaysia. The best way to enjoy it is during the evening at a Ipoh street food stall, at the time of day when the outside temperatures start to cool off. Where to eat Won Ton Mee: We enjoyed Won Ton Mee at a small stall at the night street food market on Jln Sultan Ekran (see 8 on the map). There were several stalls serving Won Ton Mee when we visited and they all were very busy. Are you enjoying our Asian city food guides? Check out our other post for our ultimate guide to the best food in Hanoi Old Quarter! We show you all the amazing highlights to help you make the most of your stay in this beautiful city! Now this dish is maybe not the most typical food to eat in Ipoh, but it tastes too good for me not to mention it! When you order the Tau Eu Bak Ricebowl you get a bowl filled with rice, braised pork belly, some greens, egg and a delicious deeply flavoured brown sauce. This dish is tasty all the way through to the last bite. Where to eat Tau Eu Bak Ricebowl: The place we had this dish is called Aud’s by JJ Cafe (see 9 on our map) and you can find it in the centre of the old town. In our opinion, Aud’s is the best Ipoh cafe. Another rather untypical Ipoh food recommendation, but it would be mean of us to keep this as a secret. This sandwich is probably the second best sandwich we ever had in our lives (after Banh Mi in Vietnam). The pulled pork almost melts in your mouth and all you wish to do after you ate this king of a sandwich is to order a second one. It’s the perfect choice if you crave some western food in Ipoh. Where to eat Pulled Pork Sandwich: Like the Tau Eu Bak Ricebowl, we also had the Pulled Pork Sandwich at Aud’s by JJ Cafe (see 9 on our map) in Ipoh town. TripGourmets are not the biggest fans of desserts, mostly because by the time dessert rolls around we have overstuffed ourselves on the preceding courses. However, we gladly make an exception for this dish! Tau Fu Fah, a famous Ipoh dessert, is a soy milk custard pudding, served with some clear syrup. It normally is served warm and the taste is only delicately sweet. At the same places where you can buy Tau Fu Fah you also get some tasty chilled and lightly sweetened soy milk. Where to eat Tau Fu Fah: The best Tau Fu Fah is available during the day at a place called Funny Mountain (see 10 on our map) and there are always a lot of customers there. The probably most famous drink from Ipoh is the local White Coffee. To make this coffee, the beans are roasted in margarine. After this they get ground, brewed and served with sweetened condensed milk. It is the addition of milk in the end that causes the coffee to be called “white”. The beans are actually just normal imported coffee beans. There are so many places you can get this famous drink and so many that claim to serve the best coffee in Ipoh! Ipoh White Coffee often gets mentioned as one of the best coffees in the world! Where to drink White Coffee: As there are so many places to get White Coffee, you could take your pick. For the fun factor though, we recommend having your White Coffee in the Nam Heong Ipoh Soho (see our map below). This place is a really nice local cafe in Ipoh which also serves decent food. What makes it really unique though is that as well as having some of the best white coffee in Ipoh, your food is brought to you by robot waiters straight from the future. Awesome eh? And if you can’t make it to Ipoh but still want to try some of the delicious White Coffe, then you can order it on Amazon. Order your White Coffee here if you are from the US. Order your White Coffee here if you order it from outside of the US. An ice-cold snow beer is something we really appreciated after we spent the day hunting for things to do in Ipoh in the hot and humid climate of the area. The process to make snow beer is actually quite simple. They put the beer glasses in the freezer until they are completely frozen. The beer is also chilled to be super-cold. Because of the cold of the glass, and the beer, the foam turns icy when they serve it and it looks a bit like snow. The foam also tastes a lot less bitter with this technique. As a beer drinker, I love this way to have a beer. Where to drink Snow Beer: There is one corner in the old town of Ipoh with several places with the same name: Kafe Sun Yoon Wah (see 12 on our map). Our friend told us that they somehow all belong together and that it doesn’t matter where you sit. Funny additional info: When you order two beers, you get one free try at one of the fairground style claw machines. Avocado and coffee are both awesome, but what happens when you mix them? They get super awesome! This was the second time we have tried an avocado coffee and it was definitely the best we had so far. If you never tried it before you should definitely give it a go if you love the two ingredients avocado and coffee. It’s like an ice-cream smoothie, except avocado is way healthier than ice-cream, right? Avocado and coffee, what a great combination! Where to drink Avocado-Coffee: You can get this kickstart-into-the-day drink at Aud’s by JJ Cafe (see 9 on our map) in Ipoh’s old town. In case it is too late for coffee and too early for beer, then ginger lemongrass iced tea is the drink for you. Nothing cools you down better than a delicious iced tea. The lemongrass and the ginger give this version a special kick that will revive you enough to get back out walking in that Ipoh heat. A page from the fantastic menu of goo9s. We love the Ginger Lemongrass Iced Tea! Where to drink Ginger Lemongrass Iced Tea: We had this awesome drink in a little cafe in Ipoh town called goo9s (see 13 on our map) They also have a variety of other delicious foods and drinks, so make sure to check them out. The Dragon’s Breath is a delicious cocktail we had in a bar in Ipoh. We don’t know exactly what was in it, but we definitely tasted a hint of lychee. It comes in a mug and you drink it with little bowls. The perfect drink to end an awesome day in Ipoh. Where to drink Dragon’s Breath: Now here’s the rub. We’re not allowed to tell you exactly where to find this because the place is a hidden bar. We can only tell you that the bar is called Madam Wongs and that it is somewhere hidden in Ipoh new town. We can also share that it is a very cool bar, decorated in Asian style and with a mellow vibe. Your mission, should you choose to accept it, is to find Madam Wongs for yourself, and report back to us on your verdict of the Dragon’s Breath cocktail! On these maps, you can find all the places to eat in Ipoh we recommend on this list. Just look for the corresponding number. The sheer abundance of things to eat in Ipoh means the city truly doesn’t need to hide behind Penang or Kuala Lumpur with its cuisine. There is so much good food in Ipoh that you could spend weeks there and always find something new to eat. We are very sure that Ipoh will be soon firmly in the international spotlight, and its famous dishes will play a big part in getting it there. Hopefully, our post about the best food in Ipoh answered any of your questions about where to eat in Ipoh, helped you to get a nice overview of the food scene in Ipoh, and peak your appetite to make Malaysia your next destination. And if you are still hungry for more delicious food from Malaysia, then go and check out our post about thebest Hawker food in Penang. If you are more interested in what to do in Malaysia’s capital, then read our ultimate guide about Kuala Lumpur. Pin it on your Pinterest wall! Our now good friend Eric Chuang! Eric is an Ipoh local we met at his business Incubator4U, the only co-working space in the city. He was kind enough to show us many of the foodie places featured on this list, including Nasi Ganja, Funny Mountain for the soy milk desserts, and Madam Wongs hidden bar for the cocktails. If you are in Ipoh and in need of a space to get some work done, head over to Incubator4U and tell Eric we said hi. Want to read more about this city than just Ipoh famous food? Check out our post about the best things to do in Ipoh! We show you all the amazing highlights to help you make the most of your stay in this beautiful city! Do you want to experience the fantastic food of Ipoh first hand but you stay in Kuala Lumpur? Then check out this amazing food tour! Have you already decided that you want to visit and eat all the mouthwatering Ipoh food? Then check out our deals finder below to find all the very best hotel deals for your stay! Did we forget your favourite dish in Ipoh? Then let us know in the comments. We’re always happy to discover new foods and cuisines!